A Facebook press release explains why the social media Leviathan is totally not logging your phone calls and text messages without your consent, even though it totally is. And is the Facebook mobile app listening to your conversations, and using that data to target ads to you? Facebook says no. But Christopher Wylie, the former Director of Research at Cambridge Analytica, now turned whistleblower, says maybe. Let the rumor wars begin. Pavlos Georgiadis built his own 3D printer from scratch. Not content to create plastic widgets, he taught it to play a Beethoven tune. Call me when it can chew gum. 15-year-old Darian Lipscomb claimed the Snapchat username "@CarnivalCruise" before Carnival Cruises did. But instead of suing him for misappropriating their trademark, the company did something fun. They rolled into Prospect, Virginia where Darian lives, and put up signs asking "Hey Prospect, does anyone know Darian?" The surprised teen agreed to relinquish the handle in exchange for a cruise valued at $5000. The first Chrome OS tablet is finally here, just in time for people who haven’t been getting enough CR2OS in their normal diets. The Senate Judiciary Committee has summoned the CEOs of Facebook, Google, and Twitter to an April 10 hearing to discuss data privacy. Current members of the committee are identified here. Whether you’re a constituent of a member or not, let them know what questions you want answered. Apple seems to think it can beat Google Chromebooks in classrooms with a cheaper iPad. Crooks are injecting malware into users’ devices with sketchy QR-code reading apps. Be careful what you let your phone look at. Big Brother is not the only watcher. 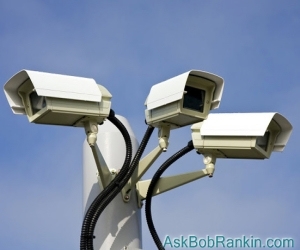 If you thought your Homeowner Association (HOA) was too nosey in the past just wait until it installs security cameras on your street, as many HOAs are now doing. Pick up that litter, Mr. Johnson. And curb your dog! An experimental self-driving Uber car crashed in Arizona, killing a pedestrian. In response, Gov. Doug Ducey has revoked Uber’s permit to operate self-driving cars on State roads. Fortunately, that leaves sidewalks, staircases and public fountains. The MiracleGro Aerogarden Bounty Elite is a Wi-Fi-enabled countertop gardening system. But if you hate gardening enough to spend $249 to take all the work out of it, wouldn't you be better off going to the supermarket and buying pre-killed plants cheaply? Most recent comments on "Geekly Update - 29 March 2018"
I disabled facebook and the rest of social media apps on my phone as soon as I took it out of the box. I don't have time for social media or care about it. Its a total waste of time! Amazon should be on their list too. While browsing Facebook, everything I have ordered from Amazon over the past many months appeared for me to see on FB. Not sure why they want to know this as it can't be of interest to anyone except their advertisers but too late for them since deals were already finished. Amazon is too big and taking over too much! Google does the same, Try removing your google account from your android and watch all your contacts get deleted. Great Come Back from the previous article. Folks don't get they are losing everything to politicians and corporations. It would not be happening if people weren't so apathetic and letting someone else worry about it. Try living in a town like VA Beach were cameras and facial recognition (all for the greater good) goes on. The Commonwealth has been a test and proving ground for a lot of invasive technology.